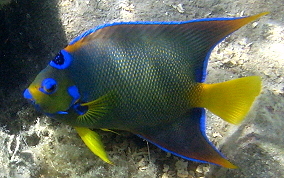 The Queen Angelfish has a dark blue spot on it's forehead, but there really is no mistaking an adult Queen angelfish. 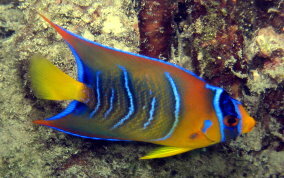 As juveniles they can be mistaken for the Blue Angelfish, but Blue Angelfish are very rare here in the Caribbean. If you happen to be elsewhere, then look closely at the second body bar. 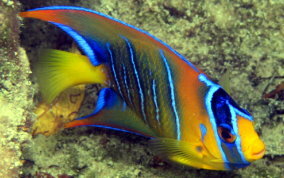 The Queen Angelfish's bar is curved, the Blue's is straight. 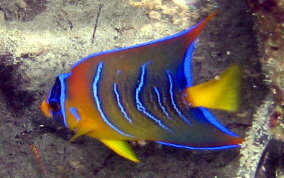 The Queen Angelfish's tail is bright yellow. 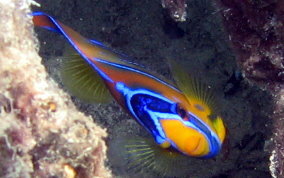 Juveniles can be found along rocky shorelines and in patch reefs where they act as cleaner fish. As they mature, they move into deeper water of 20 feet or more. when the water is clear, you will be able to observe them, even at that depth. 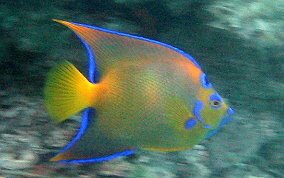 Like all angelfish, why often swim laying on their sides. Queens can grow to about 1.5 feet in length. They are somewhat carefully curious and will peek at you from a secure vantage point.